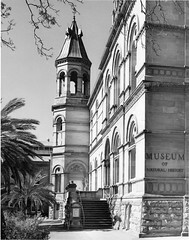 Within 18 months of the opening of the South Australian Museum’s North Wing in 1895, the director stated that “the plain fact is that in spite of the greatly increased accommodation afforded by the new building we are still cramped for space”. By 1908 construction was under way on a wing similar in style to the west wing (the Jervois Wing), now the Mortlock Library of South Australiana. However, it was 15 feet wider, with one tower instead of two, and with three floors and a basement. Building took seven years because of the difficulty of obtaining enough stone. Built for £36,283 by T.F. Brown, it was officially opened by the governor, Sir Henry Galway on December 8, 1915. The external walls were of Murray Bridge freestone, backed by “Hindmarsh” bricks. Most of the flooring was reinforced concrete. In his first annual report as museum director, Edgar R. Waite lamented that “the requirements of the Museum have been made subservient to the architectural features, the new building having to conform in general to that of the Public Library”. By this time, dressed cut-stone buildings were becoming exorbitantly expensive to built, leaving little regard for the cost of such essential matters as internal design, fixtures and fittings. Despite the controversy surrounding the construction, the architectural significance of the building is high. 2 October 1925; SAPP, No. 30, 1907-08.